I’m wearing white shorts for Pete’s sake. There can’t be a whole lot of pessimism in white shorts. While there isn’t pessimism, there are a few thoughts. The trade deadline has come and gone and the Jays wound up doing very little, on the surface. The thing is, did they really need to? Yes, other teams have gotten markedly better, with the Detroit Tigers and Oakland A’s doing everything but reenacting the Ralph Macchio-Steve Vai Crossroads guitar duel in their acquisitions of David Price and Jon Lester/Jeff Samardzija respectively. The Yankees did Yankee-ish things, adding overpaid role players, a luxury that they and the Dodgers alone seem to have. Are the Blue Jays safe? And the Jay did Jay-ish things, as they also have done all season. They added Danny Valencia, a third baseman who hit lefties decently. They did so by trading other bargain-basement players who had played themselves into some value, in Eric Kraatz and Liam Hendriks. Valencia and Steve Tolleson, another bargain-bin find, hit left-handed pitching well enough to give the team some options once Brett Lawrie returns (and he’s close!). Nolan Reimold, when healthy, has looked like he’s at least worth a shot. Dan Johnson has been solid. These are all quality AA finds, players helping a hurting ballclub get through a long, long season. For those clamouring for Martin Prado: he’s due more than 20 million dollars over the next two seasons and already plays the same position where Lawrie is best. He is also not that great a baseball player. If the team adds him, no chance it re-signs Melky Cabrera. Would you trade Melky for Prado straight up? Me neither. So shut your pie holes. Yes, there is the seeming frustration that the Jays failed, again, to make a meaningful acquisition to push themselves over the top. It’s last off-season all over again. But you know what? This team already has its meaningful pieces. The biggest need for the Jays in the first half of the season was to find pitching depth. OK, sounds tough. Hey now! Marcus Stroman, added to the team as a starter in mid-May, has since been their best starting pitcher. Aaron Sanchez is in the big leagues, albeit on an innings cap. J.A. Happ has emerged as a not-terrible fifth starter. Todd Redmond has been lights out as a long man. Pitching depth found. The clamouring since has been to solidify the infield. 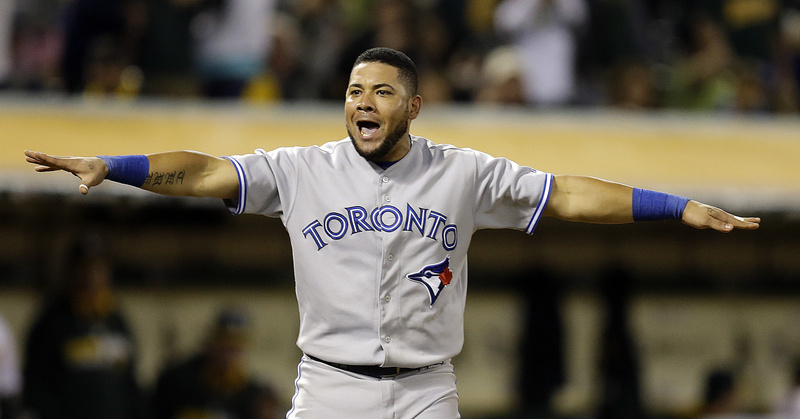 Well, in Lawrie and Edwin Encarnacion’s absence, Munenori Kawasaki has filled in admirably, Tolleson has been decent, Ryan Goins has yet again shown his all-world calibre defense (and is even hitting a bit) and Juan Francisco has been… Juan Francisco. So in two weeks, when Encarnacion and Lawrie are presumably back and rolling, the team is actually going to have a tough call to make with the glut of productive infielders on its roster. Infield depth found. Could they have used a bullpen arm? Sure and I still think they’ll add one. It’s baseball, remember? The ‘trade deadline’ is only the non-waiver version, meaning teams can still make roster moves for another month, until August 31st; players just need to pass through waivers first. I can easily see the Jays sneaking a move in to add some depth to the ‘pen, which they’ll need, particularly when Sanchez hits that innings limit. The point is, none of this should surprise us. For all the talk about the ability to add payroll, it was clear in the aftermath of some of the trades that got done that the Jays just didn’t have the prospects to acquire Lester, Price or Samardzija. They just didn’t. From the beginning, Alex Anthopoulos has talked about creating a sustained culture of winning. Not a one year run at the Wild Card, not all the eggs in one basket. He put his money where his mouth was when he made the Marlins mega-deal and the follow-up Mets deal. He went for the jugular and built the core of a win-now team. But that absolutely does NOT mean he has to sacrifice any semblance of future talent. Stroman and Sanchez: hope for the future? Marcus Stroman, Aaron Sanchez, Dan Noris, Roberto Osuna. I just named your potential 2017 Blue Jays starting rotation. All are young, controllable and electric. Dalton Pompey probably won’t hit the Majors full-time until 2016, but if Colby Rasmus walks, we’re just an Anthony Gose/Free Agent X year away from seeing him in Toronto. If you wanted to add even one of the aforementioned big names, any/all of those players would have been dealt and that still would have been a stretch. Aces don’t grow on trees. Let’s try and grow some of our own. The job of a general manager isn’t just to go for the here and now. It’s to look at both the short and long term. I think Anthopoulos has done that. We have young prospects that are starting to knock on the door again. We’re currently sitting in the second Wild Card position, a play-in game with the Angels away from PLAYOFFS. We’re still only 3.5 games off the division lead with 50 games to go. This team is a contender and it’s contending. It doesn’t need a saviour, it just needs to get healthy. These Jays are who we thought they were, and that is a pretty good baseball team. Stop whining and start cheering. Now I’m off to blind some people with my shorts, excuse me.